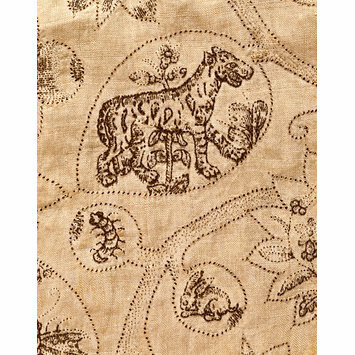 The imagery on this early 17th-century linen jacket is one of the most visually sophisticated examples of its kind. A range of beasts, real and fantastic, flowers, birds and insects adorn the jacket, each enclosed within leaf, fruit or flower-shaped compartments as part of the naturalistic design. Several motifs have been inspired by images from emblem books, a popular genre of literature in the 16th and 17th centuries. Inspired by classical mythology as well as folk tales, emblems combined visual images with mottoes and poems expressing moral sentiments. Emblematic images and text influenced a wide range of visual media and literature during the period, including this jacket. The tragedy of this masterpiece of erudition and design is its deteriorating condition. The dye that created the inky black colour of the silk embroidery thread was fixed with iron. Over the years, the iron oxidises (rusts) causing the silk thread to disintegrate. The extent of the loss is evident in these details; only a few motifs remain intact. There are to date no modern conservation techniques to halt this disintegration. These photographs record the endangered splendours of this garment. 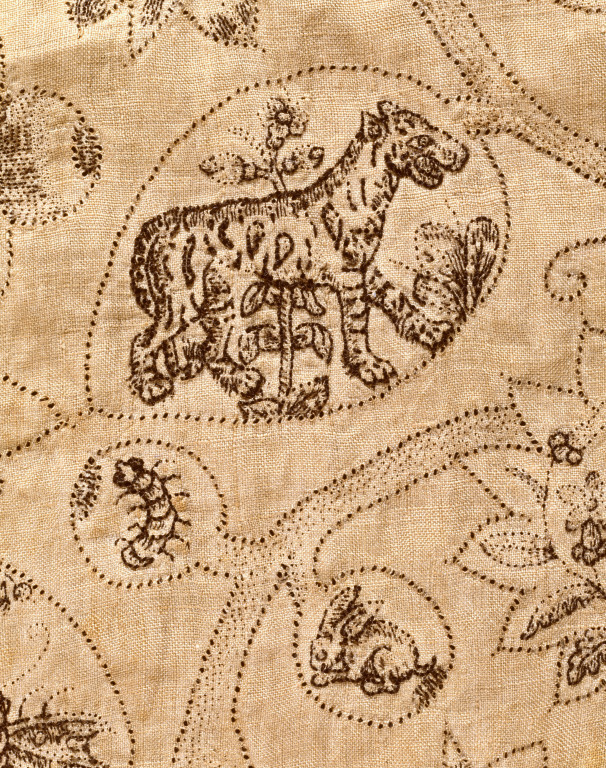 A woman's linen jacket, embroidered in black silk (blackwork) in a range of animals, birds, fish and emblematic devices. Unlined.